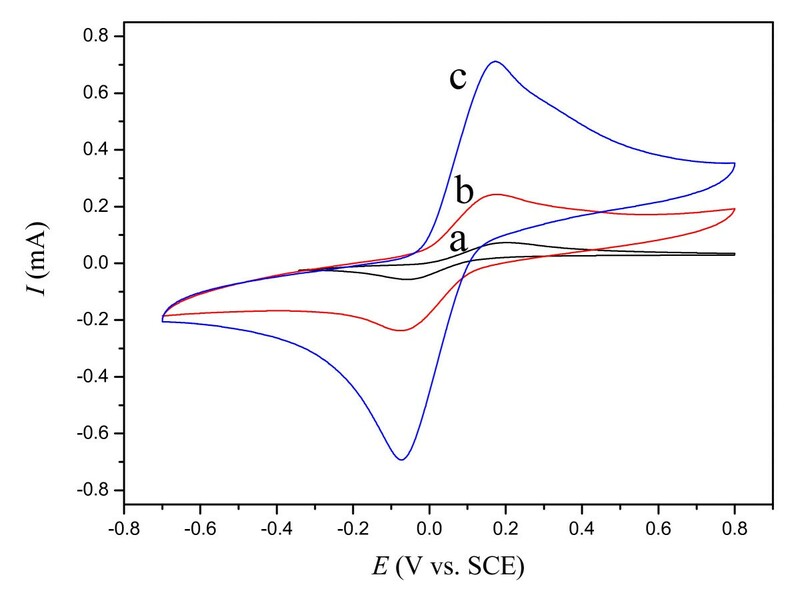 Three types of carbon paste electrodes (CPEs) with different liquid binders were fabricated, and their electrochemical behavior was characterized via a potassium hexacyanoferrate(II) probe. 1-Octyl-3-methylimidazolium hexafluorophosphate ionic liquid (IL) as a hydrophobic conductive pasting binder showed better electrochemical performance compared with the commonly employed binder. The IL-contained CPEs demonstrated excellent electroactivity for oxidation of hydroquinone. 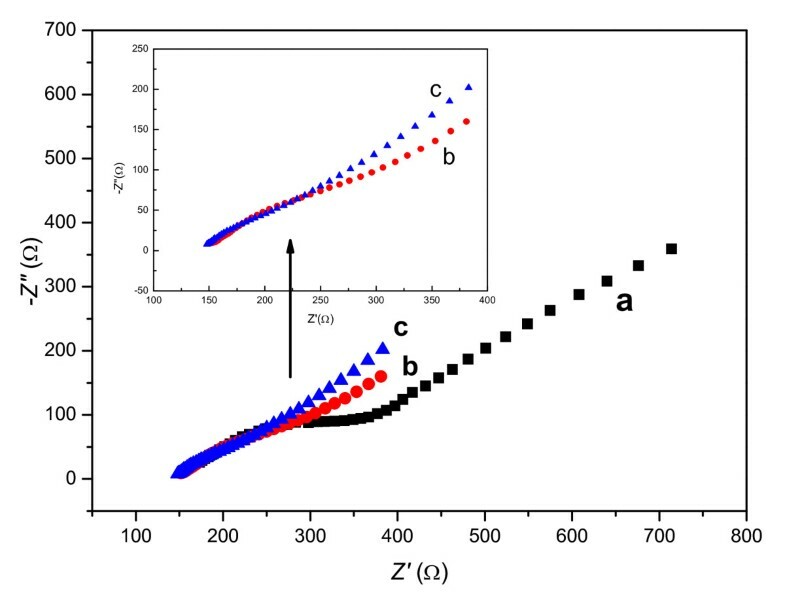 A diffusion control mechanism was confirmed and the diffusion coefficient (D) of 5.05 × 10-4 cm2 s-1 was obtained. The hydrophobic IL-CPE is promising for the determination of hydroquinone in terms of high sensitivity, easy operation, and good durability. Hydroquinone (H2Q) is widely used in many fields such as reducing agent, antioxidant, polymerization inhibitor, black white film developer, anthraquinone dye, azo dyestuff and other chemical intermediate[1, 2]. However, because of its toxicity to humans and difficulty in degradation, H2Q is also considered as a serious environmental pollutant. Thus, it is very necessary to find simple and efficient analytical approaches for the determination of H2Q. Several analytical methods have been developed including high performance liquid chromatography[4, 5], flow injection analysis, spectrophotometry[7–9], and electrochemistry[10, 11] etc. In consideration of its good electrochemical activity, electro-oxidation of H2Q could be a competitive method for the determination of H2Q via recording electrochemical response[12–14]. The carbon paste electrode (CPE), first introduced by Adams, is one of the most commonly used electrodes. Due to its low cost, ease of fabrication, high sensitivity and renewable surface, the CPE has been widely applied in the electroanalytical community. A traditional carbon paste electrode is composed of graphite powder and pasting liquids. Typical parameters required for pasting liquids are: i) chemical inertness and electroinactivity, ii) high viscosity and low volatility, and iii) minimal solubility in aqueous solutions. Thus, the commonly used pasting liquids for the preparation of carbon paste were focused on organic mineral oils (e.g. nujol, paraffin)[17, 18]. However, there exist two obvious disadvantages for mineral oil-type binders (or pasting liquids) since they are not component-fixed organic compounds. One is the presence of impurities that may give rise to undesirable effects on trace electroanalysis. The other is the inherent non-conductivity that can diminish the electrochemical sensitivity of the paste electrode. Therefore, the use of alternative viscous liquids with chemical inertness and inherent conductivity as a pasting binder may be very helpful for improving the electroanalytical performance of the CPE. Ionic liquids (ILs) or room temperature ionic liquids (RTILs) that are entirely ion-composed fluids at ambient temperature have been received much attention in many fields over the recent years[19–28]. In view of high chemical stability, wide electrochemical window, good ionic conductivity, no detectable volatility and suitable viscosity for binding carbon particles, many types of ILs could be served as promising pasting liquids for the preparation of carbon paste. In 2005, we first proposed the use of ILs as liquid binder fabricating a novel IL-type CPE and demonstrated its excellent electrochemical performance in catalysis and detection of electroactive substance19. Much to our gratification, this IL-type CPE has soon attracted a great attention in the fields of electrochemistry and electroanalysis. Moreover, this pioneering work was recognized by the world-renown electroanalysts[29, 30] and followed by lots of colleagues in different teams. Maleki et al. fabricated the IL-type CPE which was found to be electrocatalytic towards the detection of biomolecules such as NADH, dopamine. Shul et al. investigated ion transfer between the electrolyte and the IL-type CPE. Sun et al. fabricated a IL-type CPE with molecular nanofilm of CaCO3 (entrapped in Nafion) as effective sensor for hemoglobin (Hb) via the transformation of Hb-Fe(III)/Fe(II) redox couple. Compton and colleagues demonstrated that the problem of large capacitive currents at IL-type CPE can be overcome by using steady state linear sweep voltammetry at a rotating disk IL-type CPE electrode. Musameh and Wang fabricated an IL-type CPE microelectrode to minimize capacitive currents that further enhanced the faradic response. To the best of our knowledge, there are a lot of interesting programs relevant to IL-type CPEs being underway. In this work, we fabricated three types of CPEs with different liquid binders and characterized their electrochemical behaviors via potassium hexacyanoferrate(II) probe. The used pasting binders are mineral oil, 1-octyl-3-methylimidazolium hexafluorophosphate (OMIM-PF6), and their mixture with half doping, respectively. The selected OMIM-PF6 (shown in Scheme 1) was a hydrophobic IL that is more efficient for ion transfer within the CPE than other polar liquid. By comparison, the hydrophobic OMIM-PF6 IL-type CPE demonstrated the best properties suitable for the electroanalytical candidate electrode. Thus, the electro-oxidation of H2Q at the OMIM-PF6 IL-CPE was investigated, and it presented the promising prospect for determination of H2Q. Potassium hexafluorophosphate (analytical grade, Alfa Aesar, USA), hydroquinone (analytical grade, Southern Chemical Reagent Inc., China), mineral oil (chemical purity, changsha Fenlukon Plastics Chemical Plant, China), potassium hexacyanoferrate(II) (analytical grade, Xi'an Chemical Reagent plant, China), heptane (analytical grade, Shantou Guanghua Chemical Plant, China), sodium dihydrogen phosphate, disodium hydrogen phosphate (analytical grade, both from Tianjing 6th Chemical Reagent Plant, China), graphite powder, acetonitrile (Both from Sinopharm Chemical Reagent Co. Ltd, China), and ethyl acetate (analytical grade, Nanjing Chemical Reagent Co. Ltd, China) were used without further treatment. N-methylimidazole (analytical grade, Alfa Aesar, USA) and 1-Bromooctane (chemical purity, Sinopharm Chemical Reagent Co. Ltd, China) were purified as described elsewhere. All aqueous solutions were prepared by using doubly deionized water. Phosphate buffer solution (PBS) was prepared by mixing 0.05 mol L-1 NaH2PO4 and 0.05 mol L-1 Na2HPO4 with 1:1 volume, the pH was then adjusted to 7.0 with 0.1 mol L-1 H3PO4 and 0.1 mol L-1 NaOH. The imidazolium bromide salts were synthesized with a modified procedure reported elsewhere[36, 37]. Definitely, the freshly distilled N-methylimidazole (4.0 mL, 0.05 mol) and heptane (30 mL) were poured into a 100-mL three-necked flask equipped with a reflux condenser. 1-Bromooctane (8.7 mL, 0.05 mol) was added dropwise through a drop funnel. The mixture solution was stirred at 70°C for 24 h, then cooled to room temperature, a two-layer solution formed. The lower layer was kept and washed repeatedly with ethyl acetate. After distilling, the imidazolium bromide salts were obtained. The OMIM-PF6 ionic liquids were synthesized with the imidazolium bromide salts and KPF6. The 1-octyl-3-methylimidazolium bromide was transferred in a 250 mL round bottom flask, in which an equimolar amount (0.05 mol) of 130 mL KPF6 solution was added dropwise. The reaction was kept for 24 h at room temperature under stirring. The water-insoluble OMIM-PF6 formed in the bottom of the flask. The resultant OMIM-PF6 was washed repeatedly with water until no free Br- could be detected in the aqueous washings by AgNO3. After dry at 80°C in vacuum for 10 hours, the OMIM-PF6 ionic liquids were sealed in store. As-synthesized OMIM-PF6 ionic liquids were analyzed. IR: 3171 and 3125 [ν(C-H) aromatic]; 2929 and 2858 [ν(C-H) aliphatic]; 838 [ν(P-F)]; 1574 and 1467 [ν(C = C)]. The 1H NMR spectrum contains peaks at δ 8.47, 7.30, 7.27, 4.12, 3.90, 1.85, 0.86. The carbon paste electrode was generally prepared as follows: 0.20 g graphite powder and 0.05 mL liquid binder were mixed in an agate mortar and ground for 15 minutes to form a uniform paste. The homogeneous paste was packed into a cavity (1 mm diameter) at the end of a Teflon tube. The electrical contact was provided by a copper wire connected to the paste in the inner hole of the tube. Three types of carbon paste electrodes marked M-CPE, IL-CPE and MIL-CPE were fabricated by using different binder, i.e. mineral oil, OMIM-PF6 ionic liquid and mixture of mineral oil/ionic liquid by half volume, respectively. Prior to use, the surfaces of the as-prepared CPEs were carefully smoothed with the weighing paper. The electrochemical cell was assembled with a conventional three-electrode system including a well-fabricated CPE as the working electrode, a saturated calomel electrode (SCE) as the reference electrode, and a large area Pt disk as the counter electrode. A CHI 660 electrochemical work station (CH Instruments) was employed for the electrochemical measurements. All measurements were carried out at room temperature (21-23°C). 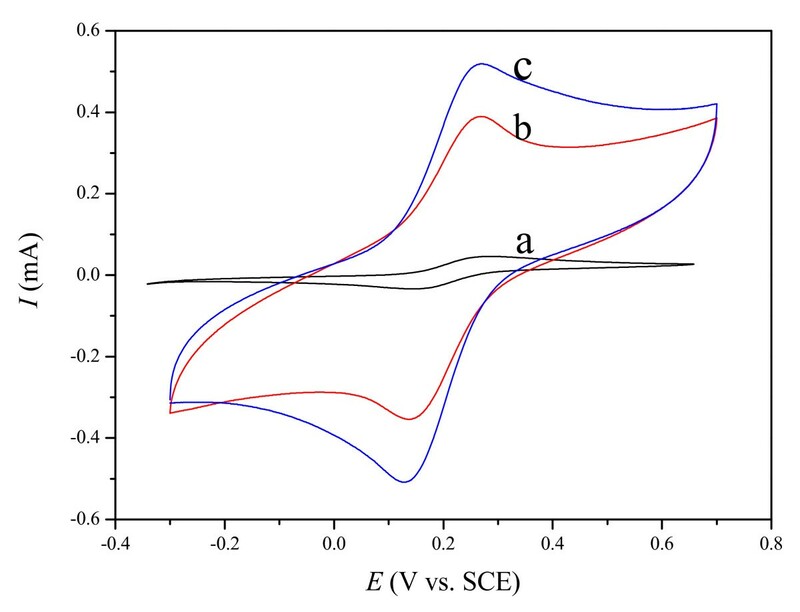 In cyclic voltammetry (CV) measurements, the electrochemical windows of Potassium ferrocyanide and H2Q were -0.3V-0.7V and -0.7V-0.8V, respectively. In electrochemical impedance measurements, the applied perturbation amplitude was 0.005V, the frequencies swept from 104 to 0.1Hz. The electrode performance of the as-fabricated CPEs could be evaluated via probing [Fe(CN)6]3-/[Fe(CN)6]4- couple reaction. Figure 1 shows the electrochemical responses of the M-CPE, MIL-CPE, and IL-CPE in 10 mmol L-1 K4[Fe(CN)6] + 0.5 mol L-1 KCl solution. In all cases, a quasi-reversible system with a peak-to-peak separation of c.a. 100 mV was observed, and the ratio of redox peak currents was 1. However, the current response at the MIL-CPE and IL-CPE was much larger (~ 8 and 10-fold) than that at the M-CPE, indicating the OMIM-PF6 IL was able to enhance charge-transfer capability of the electrode. The enhanced current response was ascribed to that the sole electronic conduction within the CPE using mineral oil binder changed into united ionic-electronic conduction within the CPE containing IL[19, 38]. The obvious background current for the MIL-CPE and IL-CPE boiled down to the accessible capacitance of the IL at the carbon surface[25, 39]. Cyclic voltammograms of (a) M-CPE, (b) MIL-CPE, and (c) IL-CPE in 10 mmol L -1 K 4 [Fe(CN) 6 ] + 0.5 mol L -1 KCl solution at a scan rate of 50 mV s -1 . The OMIM-PF6 IL took an important effect on kinetics of the electrode process. 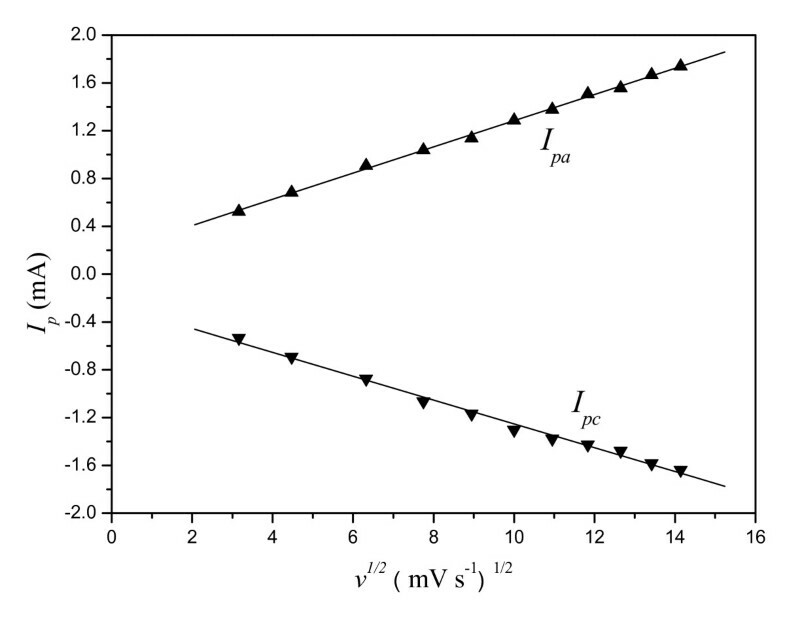 As illustrated in Figure 2, the peak current I p is in direct proportion to the scan rate v for the M-CPE (plot a) while the linear relationship of I p versus v 1/2 is presented for the MIL-CPE (plot b) and IL-CPE (plot c), which implied the CPE using mineral oil had different kinetic control mechanism from that containing IL. The former was a surface reaction control process while the latter was determined by diffusion process. This kinetic difference revealed a faster charge-transfer process within the MIL-CPE and IL-CPE due to containing the hydrophobic OMIM-PF6 IL. Linear relationship of (a) I p versus v at M-CPE, (b) I p versus v 1/2 at MIL-CPE, and (c) I p versus v 1/2 at IL-CPE in 10 mM K 4 [Fe(CN) 6 ] + 0.5 M KCl solution. It could be confirmed that the CPE containing OMIM-PF6 IL was able to efficiently observe oxidation of H2Q. Shown in Figure 3 is the cyclic voltammetric behavior of H2Q at the M-CPE (a), MIL-CPE (b), and IL-CPE (c) in a PBS (pH = 7.0) solution at the scan rate of 20 mV s-1. The peak-to-peak potential separation of c.a. 220 mV with the redox peak current ratio of c.a. 1 was observed, which indicated a quasi-reversible two-electron transfer reaction. The oxidation current at the IL-CPE was 15 and 3 times as large as the current at the M-CPE and the MIL-CPE, respectively. 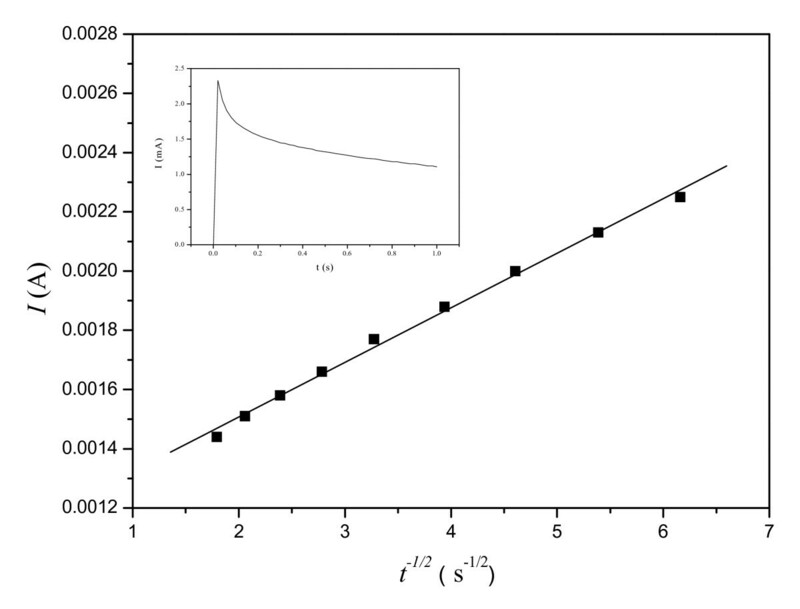 The linear relationship of Ip versus v1/2 plotted in Figure 4 indicated a diffusion control mechanism for electro-oxidation of H2Q at the IL-CPE. This result is consistent with [Fe(CN)6]3-/[Fe(CN)6]4- redox reaction at the IL-CPE. Cyclic voltammograms of (a) M-CPE, (b) MIL-CPE, and (c) IL-CPE in a PBS (pH= 7.0) containing 10 mmol L -1 H 2 Q at a scan rate of 20 mV s -1 . Linear relationship of I p versus v 1/2 at IL-CPE in a PBS (pH= 7.0) containing 10 mmol L -1 H 2 Q.
Nyquist plots of (a) M-CPE, (b) MIL-CPE, and (c) IL-CPE in a PBS (pH= 7.0) containing 10 mmol L -1 H 2 Q. The applied perturbation amplitude was 5 mV (vs.OCP), and the frequencies swept from 104 Hz to 10-1 Hz. Linear relationship of I versus t -1/2 at IL-CPE in a PBS (pH= 7.0) containing 10 mmol L -1 H 2 Q from chronoamperometry measurement (as inset shown) with step potential of 200 mV for 1s. the diffusion coefficient D of H2Q at the OMIM-PF6 IL-CPE could be evaluated from the slope. Where n is number of electrons to oxidize one molecule of H2Q, F is Faraday constant, A is area of the IL-CPE electrode (in cm2), C * is initial concentration of H2Q (in mol cm-3), and t is time (in s). The D was calculated as 5.05 × 10-4 cm2 s-1, which was larger than the reported values of 2.26 × 10-5 cm2 s-1 at N-butylpyridinium hexafluorophosphate (BPPF6) CPE13 and 7.88 × 10-5 cm2 s-1 at glassy carbon electrode. This result quantitatively disclosed a good diffusion reaction of H2Q at the OMIM-PF6 IL-CPE. The dependence of electrochemical oxidation response on concentration of H2Q at the OMIM-PF6 IL-CPE was plotted in Figure 7. It was found that the oxidation peak current obtained was linearly proportional to concentration of H2Q in the range of 0.01 to 10 mmol L-1 in the PBS (pH = 7.0) solution. 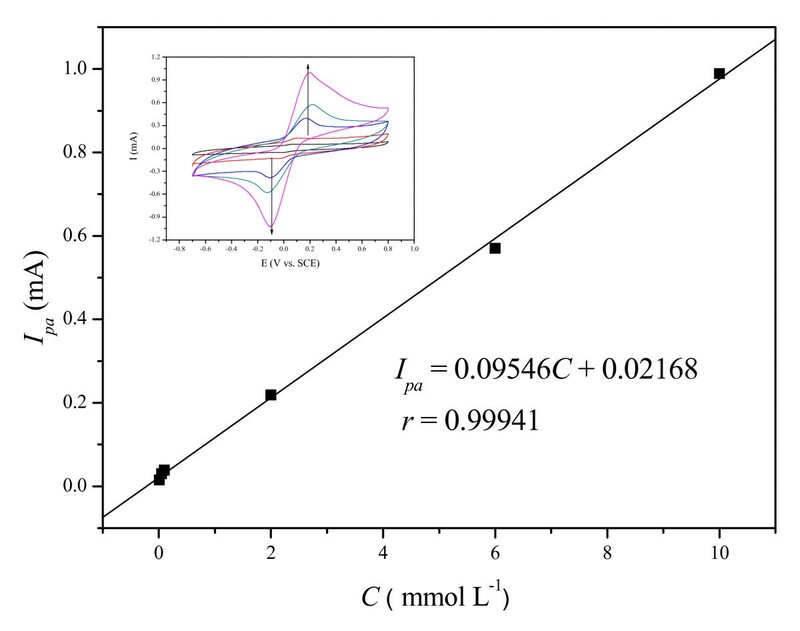 A detection limit of 8.1 × 10-7 mol L-1 was estimated via the linear equation I pa (mA) = 0.09546C(mmol L-1) + 0.02168 (r = 0.99941) with 3σ criterion, which is better than the reported BPPF6 CPE with the detection limit of 2.5 × 10-6 mol L-1. Besides the high sensitivity for the determination of H2Q, this OMIM-PF6 IL-CPE is durable, and is convenient to refresh the surface via removal of the used surface paste. Dependence of I p on concentration of H 2 Q at IL-CPE in a PBS (pH = 7.0). Inset was cyclic voltammograms at a scan rate of 50 mV s-1 with the increasing H2Q concentration from 0.01 to 10 mmol L-1. Three types of CPEs, namely as M-CPE, IL-CPE, and MIL-CPE were fabricated based on different liquid binders including mineral oil, OMIM-PF6, and their mixture with half doping, respectively. The hydrophobic OMIM-PF6 as binder component showed better electrochemical performance of the CPE due to the enhanced charge-transfer capability of the conductive IL. The IL-contained CPEs presented excellent electroactivity for oxidation of H2Q, and the electrochemical oxidation process was controlled by diffusion of H2Q. The diffusion coefficient (D) at the IL-CPE was calculated as 5.05 × 10-4 cm2 s-1 larger than the literature value at BPPF6 CPE or glassy carbon electrode. The hydrophobic IL-CPE with high sensitivity, easy operation, and good durability showed a promising application for the determination of H2Q. This work was financially supported by the National Natural Science Foundation of China (No.20976198), Hunan Provincial Natural Science Foundation of China (No. 10JJ2004), and the Specialized Research Fund for the Doctoral Program of Higher Education of China (20090162120012). YS carried out the experimental work, participated in data collection and manuscript drafting. YT participated in the design of this study and analyzed experimental data. HL proposed and supervised the program, and participated in data analysis and draft reversion. PH coordinated the study and modified the text. All authors read and approved the final manuscript.